And...just look at them! They're like brothers. Spoilt, selfish, cruel, but still I love both of them))And few month ago I thought about making a wall with them...And I hope you'll like the result! Two of my favorite characters ever put together, it's just epic! Uh.. I'm not the first one to comment. Anyway, nakama, congrats on you'r first wallpaper! Wow~ Psycho brothers! XDDD Nice combo! Thanks! Gread idea, splendid vector and an interesting background.I really didn't realise it was your first vector.You really can't tell because it's so good.Don't stop vectoring! Two of main characters put together..
now that i think about it, they are BROTHERS! Gorgeous. 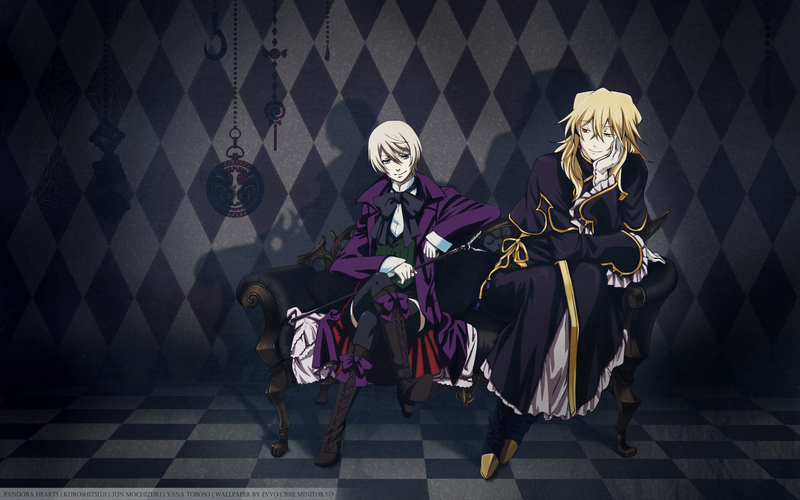 I don't know the other character, but I love Alois ?